On March 3rd, a female daycare employee from Clifton Heights, PA was arrested for apparently shoving a young child who then tumbled down the stairs at her work facility. The supervisor at the childcare center named Shawayne Tavares had been monitoring the security footage as she observed Sarah Gable, the daycare worker, forcibly handle the 4-year-old girl who was practically launched into the air down the stairs. 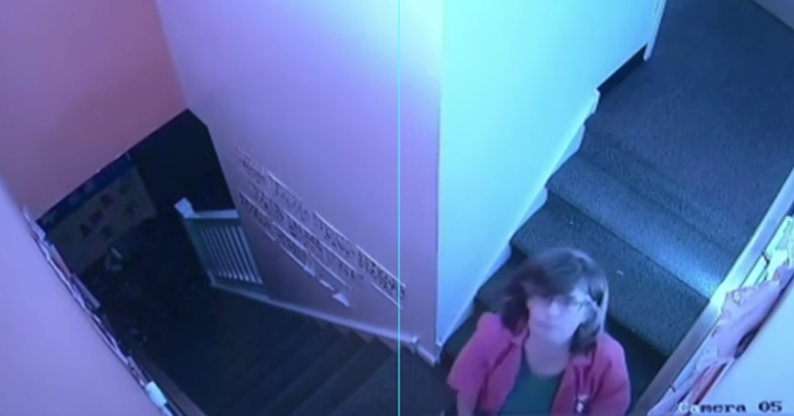 The recorded video exhibits a middle-aged female shoving the child at the top of first stairwell turn, who then falls down a few stairs down to next landing. The guilty woman then raised the child up and stared into the CCTV camera for a moment as to have noticed she had been recorded. The Philly Voice reported that security cam footage caused the daycare worker to be immediately terminated and is now facing child endangerment and assault charges. “You don’t throw a child down a flight of steps…That’s common sense,” Chitwood stated. The superintendent thanked the daycare facility for providing the footage to law enforcement. Thankfully, the child just suffered some slight knee pain and came back to the child care location a day later. The daycare employee was booked but posted a twenty-five thousand dollar bail and is now out of jail. According to the Philly Voice, the Upper Darby Police superintendant believed the bond was not harsh enough due to these particular criminal offenses against a child.